A still from the test pitch. Back at the Barnyard was a TV series that aired on Nickelodeon from 2007-2010 and on Nicktoons in 2011. 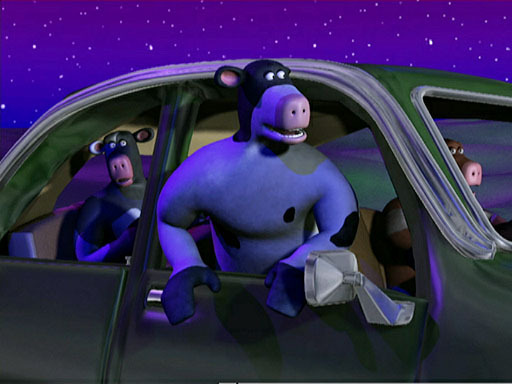 The show was a spin-off of the 2006 film titled Barnyard. Six years before the film's release, around the year 2000, a test pitch for the series was created. The short was produced by DNA Productions for Steven Oedekerk's O Entertainment. It was advertised with the tagline "What do animals do when humans aren't watching?". The pitch was never released, but footage can be found in an old teaser trailer from 2005. Screenshots from the short can also be found here. It was rumored to be a pilot for the show, but it was revealed in a tweet thread by Todd Grimes, a director of the show, that it wasn't a pilot but a test pitch. Teaser trailer with footage from the short pitch.